This is a yet unnamed backpack design. This is my first attempt at the bag -- it usually takes a few attempts before I'm satisfied with a design. What do you think? And here's a bit of the Heidi Tote. Perfect example of unexpected results. 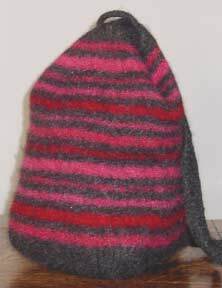 I knit up a smaller version and it turned out great, but when I translated it into the larger size things went a bit awry. I think I have a solution, but I need to work through the details and knit it up again. Moving day is just over a week away, so these designs may not be finished up until late June or early July, but I'm excited to have two in process! Speaking of moving day, our closing (the second of three!!) is tomorrow. Wish us luck! On Thursday Pete had to fly to LA for the day (isn't that ridiculous?!?) I knew that Maddie and I would go crazy if we were cooped up with each other all day, and night, long. So I decided to check out a new yarn shop that I heard about last weekend. The store is called Stitch & Hook and is located only about 5 minutes from my house! I was shocked to hear that it opened last October and I had never heard of it. So, let me tell you a little more about Ingeborg. Now that I'm into the pattern a little bit, I'm feeling much better. When I start any project that I consider to be out of my comfort zone, I always have a little fear. With Ingeborg I wasn't worried following a chart. What I was worried about was gauge. 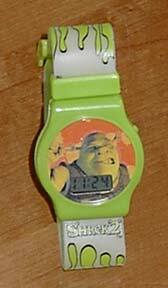 I suppose it's kind of strange that I didn't do a swatch then, huh? 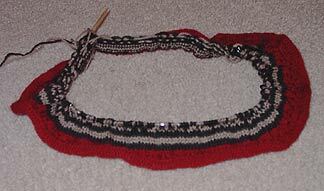 Well, my gauge issue is more a function of knitting with two colors. Theresa and I took a two color knitting class at Knitters Workshop in Chicago a little over a year ago. This is where I learned how to hold the yarn -- I hold one color in each hand. And when I designed and knit Kristina I got some much needed practice. So holding the yarn is much more comfortable for me. So what is the problem? I was afraid that I would be concentrating so much on holding the yarn correctly and following the pattern that my gauge would suffer. I also worried that with the floats, I would either end up being too loose or too tight. So, even if individual stitches were of the right tension, the whole thing would be off whack because I had the spaces between the colors off somehow. So much stress!! At the same time, I love learning new things. I was scared to start Charlotte becuase I had never done any lace, but it turned out to be my favorite project! And that worrisome lace? Of course the first few rows were a little awkward, but I got the hang of it and it turned out that it wasn't scary at all. I am please to say that the same thing is happening with Ingeborg. After *every* row I stop and check my gauge in several places. I'm pleased to say that it is 7 st./in. So once again I have worried for nothing. Moral of the story. . . just do it. As I'm sure you know by now, I'm moving. 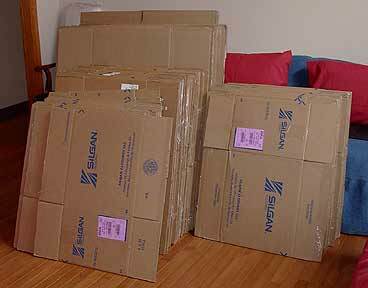 As a result, I'm going to be pretty busy packing, cleaning, unpacking and so on during the end of May and probably much of June. So I decided that I would get a jump on Ingeborg before the chaos sets in. I'm usually a pretty quick knitter, but I'm much slower with the two colors going at once. 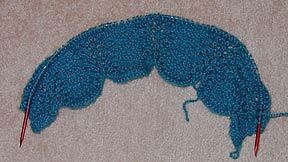 I've only done three rows of the main pattern, but my gauge seems to be good so far. This is a good thing since I went swatchless! I was just too impatient to start. This could have been a disaster, but I was lucky. So what can I say about Ingeborg so far? I love the colors. The pattern is easier than I thought it would be. And that's about it for now. Once I get into the pattern more, I will take better pictures! Look what just arrived at my house. The thought of packing everything that we own simply overwhelms me. But at the same time I have a strong desire to get started. Perhaps the stress of the move has given me startitis. At Hobby Lobby the other day I found some Lion Brand Jiffy on clearance and bought some to start another Critter Knitter's blankie. 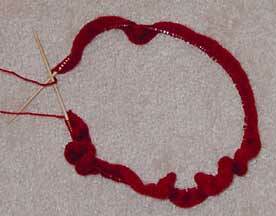 I'm making this one using the feather and fan stitch. And can you guess what I cast on last night? 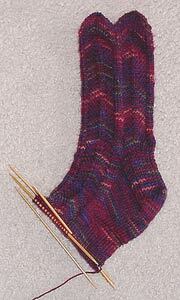 Here is my current SIP (Sock in Progress). 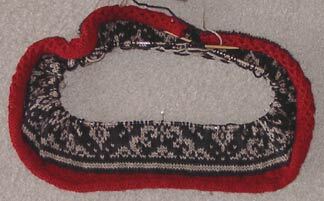 I'm using Rob's Broadripple pattern, but I'm using the one written for Lorna's Laces that has you cast on 64 stitches. It really works well with the Bearfoot that I am using. Theresa got me this yarn for my birthday. I had been admiring some that she was using over the winter to make some socks and I really wanted to try it out too. After working with it for about a week now, I have to say that I *love* it! There will be more Bearfoot in my future! I also want to say something about the Broadripple pattern. I'm a simple sock girl -- stockinette sitich in the round or K2P2 ribbing if I feel like working a bit harder -- so I shied away from this pattern for quite a while even though I liked the look of it. For me, socks are "mindless" projects and these did not look mindless. Having said that, I really wanted to do something special with this beautiful yarn. I was reluctant, but I have to say that this is a *wonderful* pattern! Great job Rob! After only a couple repeats, I had this pattern memorized. So, I get the "mindless" factor while getting the beautiful results. And I have to say that this pattern and the Bearfoot work really well together. The picture I took just doesn't do the colors justice. Enough gushing about my love for my current project. 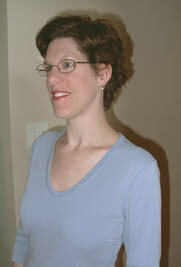 I leave you with a picture of my new haircut. It is *way* shorter than I have ever had my hair cut, and I think I'll be growing it out a few inches, but it isn't too bad. And my hair drying time has been cut by about 75%!